Maneuver your rolling tray table anywhere you need a table for meals, activities and more. 3"H steel H-base base with swivel casters easily rolls under beds, sofas and recliners. Smooth, stable surface locks in place for flat or angled use over furniture. Tabletop of tray table measures 23 1/2" L x 16" W; height adjusts 27 1/2"-47". Wood grain laminate top. Easy assembly required. No express shipping. Assembly took a bit longer trying to fit the two pieces (B and C) evenly into the steel tube running underneath the table piece. However, once we place the heavy table piece upside down and on a convenient flat surface, the two pieces slid in evenly with no difficulty. And then we were able to secure it tightly with pieces D and E, the nut and screw onto the end. It is secure and roatates easily and is exactly what we needed. I ordered the product for my Aunt in order to make it easier to get her legs under a table and be able to pull it closer to her. Unfortunately only 2 screws came with the top and I just found out this week-end so I have to find 2 more so they can finish putting it together. This item as well as the glasses are FANTASTIC made my life so much easier. One part of the assembly has been impossible for me to do. I think it would be great if I could get it together. It is good quality, and has a pretty wood like top. The height is adjustable. It went together easily until I got to one of the last steps of assembly. I can not get past that part...aligning the metal bar that holds the top onto the frame. I hope I can figure it out. It is a 2 person job as it is heavy for one women to put together alone. Lining that metal bar up just doesn't happen no matter how hard I try. I will keep trying though. I do not know if this is a good product or not. There are no instructions to put it together. The wheels are easy enough to figure out, but the most important part, I have no clue. I am not happy. You get what you pay for. This is a little expensive but the quality of workmanship is worth it. I have & I got my sister to get one for her son as well! I use my table at mealtime,for my laptop,all sorts of things. It has improved how I get through the day very much! I use this rolling tray table for eating meals ;Its of good quality ,very sturdy flat surface ;Best tray table on wheels ! This is so helpful to have. I bought this and a Zero Gravity folding chair in hopes this combination would enable me to work at my computer without tailbone, hip and thigh pain. It is the perfect combination. I can put my flatscreen monitor on this table, hold my keyboard and mouse on my lap and recline to work. I experience no pain while working, and the chronic pain in my tailbone is gradually resolving. The table is made of very good materials. It's a little hard to put the surface onto the top support because that support is in two pieces, which enable the surface to slant. Since I don't need it to slant, I would prefer a one-piece option, which would be easier to assemble. Otherwise, I am very happy with this purchase and expect many years of good service from this table. Need it to be able to eat on my bed. I like the idea of having a table I can put where I want it at the height that I need. Needed an extra table space and this can easily fold down when no longer needed. I am caregiver for my 91 yr old mother. 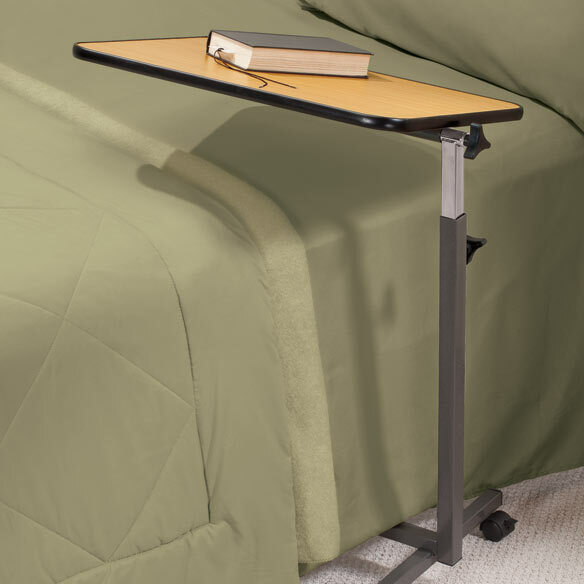 I use a hospital bed and need a table that can be adjusted and can easily roll. Also it would be nice to be able to use it for my lap top. I don't see this item anywhere else and I need this. Something I've been wanting for awhile. I need a bedside table due to recent surgery. Hope this does the trick? I am hoping this will work better for me than a 4 legged table. I needed to use it in my shop. I like the fact that they roll. 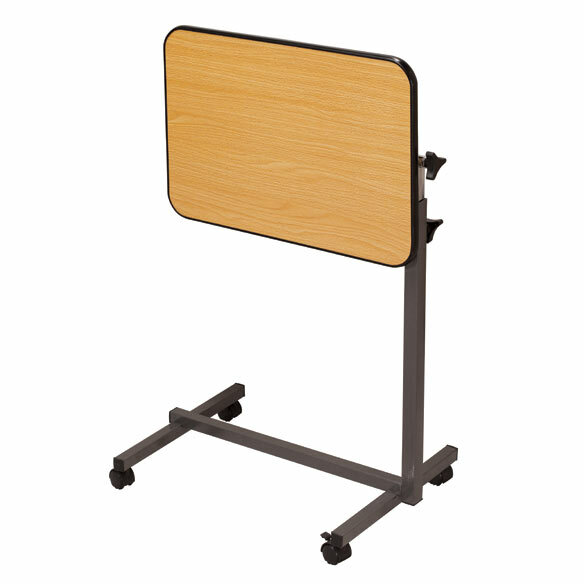 Selected this Rolling Tray Table due to the higher height adjustment and due to it having casters for easy mobility. 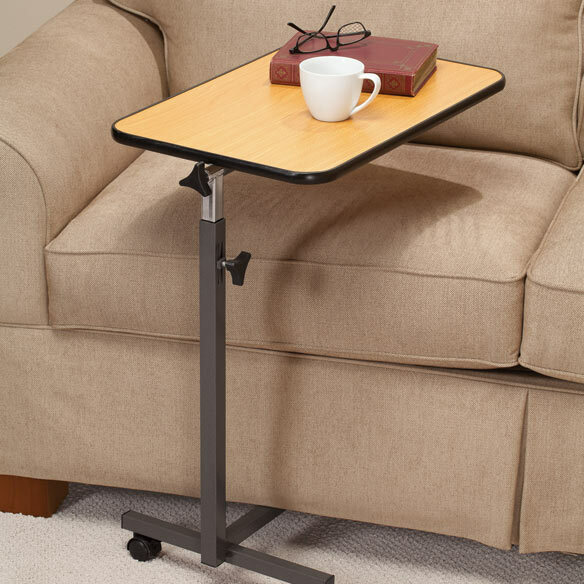 Best type of TV tray for those who are bed ridden or need to have the TV tray close to them while they are eating up right in a chair. I've chosen this item to help in the care of my 89 year old Mother and disabled brother. My dad loves to watch tv while he eats. I need a way to use my laptop in my recliner, and a way to put it aside when I get up. This will be great to put my guest thinks on, when we are having something to drink or eat. I got this to help me give manicures to myself and my niece. I really need this option for eating purposes, while in bed or during intermittent illness or just for convenience. For my own use. Nothing more. I am disabled and found this table which is the right height at a very good price. I hope this with help with the use of my computer. It would be convenient for my husband use when he does not feel like moving to the kitchen. Appears to be very functional for me. To use my laptop while sitting at other than a desk. to help my mom who sits in her recliner, but uses her laptop, etc. She won't have to lift it to get up. I ordered this for my MIL who recently went into a assisted living home. The wheels should make it easy for her to move around her room, where ever she needs it. The reviews were promising and the fact that it has adjustability. Is this item manufactured in USA? Greetings, what is the clearance needed for the wheels and metal framing? Is it 2 or 3 inches. My couch sits low and not sure it would fit under couch. The overview says 3"H steel H-base you say 3 3/4 H base. Which is it!?? does the flat table top rotate? in other words, can it be used as a side table and then rotate in to used as a tv table? BEST ANSWER: It will not rotate. You can either slide under or in front of: chair, sofa, bed. No. It tilts but does not rotate. No this table does not rotate. can the top tilt, say for reading or using a laptop? Is the top adjustable to difference positions? BEST ANSWER: It can tilt but there is nothing from keeping a book or laptop from sliding off. It's adjustable for height. The negative was it was hard to put together. I had to be a bit creative when putting it together. Thank you for your question. The table top can be tilted, as well as it can be adjusted to different heights. We hope this information will be of help to you. It can tilt but I wouldn't put a laptop on it when it's tilted. It won't stay...a book might be ok. 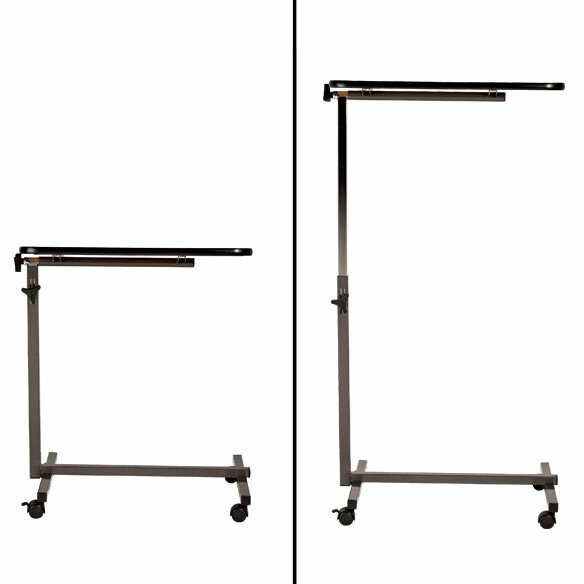 It is adjustable to different height positions. Yes, the top tilts and is adjustable. BEST ANSWER: Thank you for your question. The wheels do not lock. We hope this information will be of help to you. NO, but the casters not easily moved. Mine are on carpet and it doesn't move. How can you order replacement casters? BEST ANSWER: Thank you for your question. We do not sell replacement castors. We apologize for any inconvenience this has caused. We hope this information will be of help to you. Are there pockets for items? BEST ANSWER: I am unsure what you mean by "pockets" but this is just a tray that can be slid under a chair or bed and used as a flat surface or tilted. Just as it shows in the photographs. There are no pockets; you get four wheels, a frame and a tilting table top. Hope this helps you. no there is not, what you see is what you get. NO, it's a flat table top that can be tilted. There are no pockets or drawers on the tray. Unfortunately not. It is just the table. Unfortunately there aren't any pockets. Is there a place for pencils ? BEST ANSWER: Thank you for your question. There is no indent for pencils to be held. We hope this information will be of help to you. BEST ANSWER: Thank you for your question. The wheels are attached. We hope this information will be of help to you. Yes they are, the same as the way you put them on, turning the wrench several times. BEST ANSWER: Thank you for your question. It is 3 3/4" tall at the bottom of the bar. We hope this information will be of help to you. is this table fully assembled when shipped?? BEST ANSWER: Thank you for your question. The Rolling Tray Table does require assembly once it arrives. We hope this information will be of help to you. What is height from floor to top of crossbar without the wheels? BEST ANSWER: Thank you for your question. From the floor to the top of the cross bar that would slide underneath furniture it is 3 3/4" tall. We hope this information will be of help to you. BEST ANSWER: Thank you for your question. The Rolling Tray Table has a base that is 24" long by 16" wide. We hope this information will be of help to you.